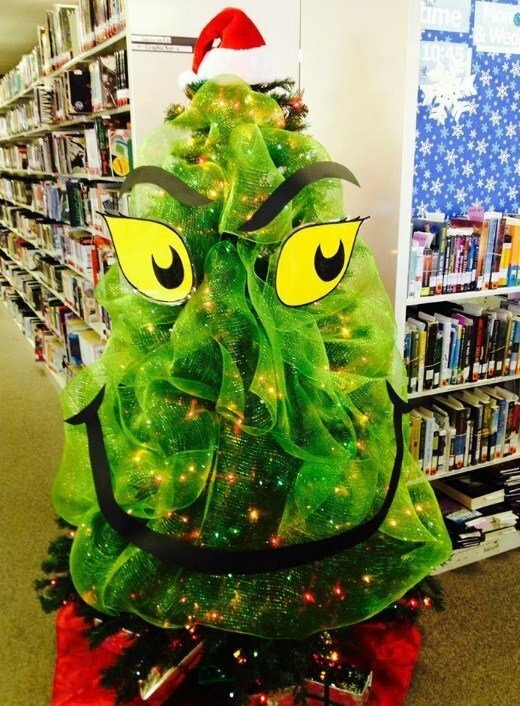 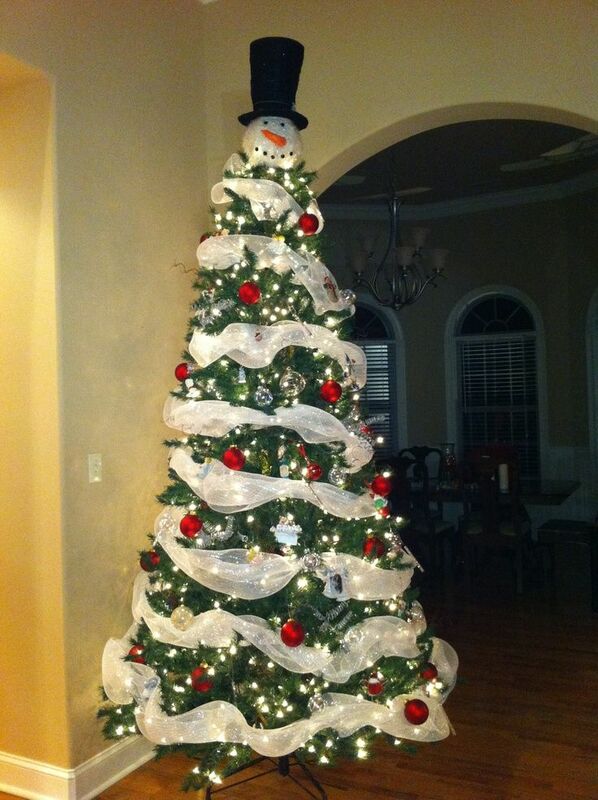 When it comes to decorating your Christmas tree, you would want to do it most creatively. 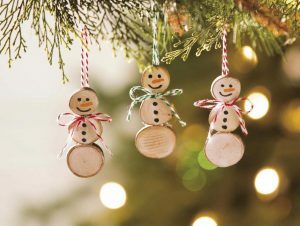 Snowmen ornaments look cute and bubbly on your tree. 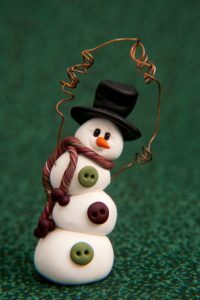 It has a classic charm that is hard to ignore. 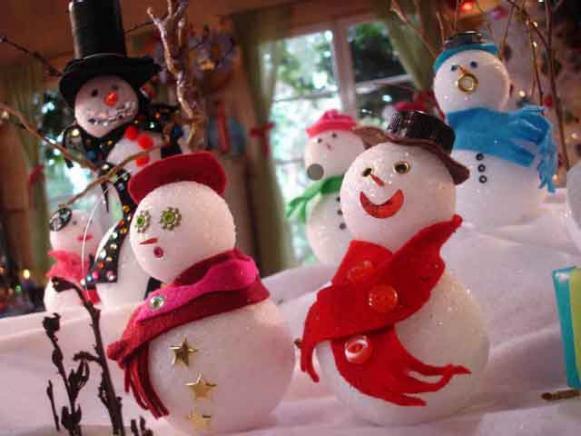 While the figure is itself white, the colorful scarf that it adorns gives it a vibrant look. 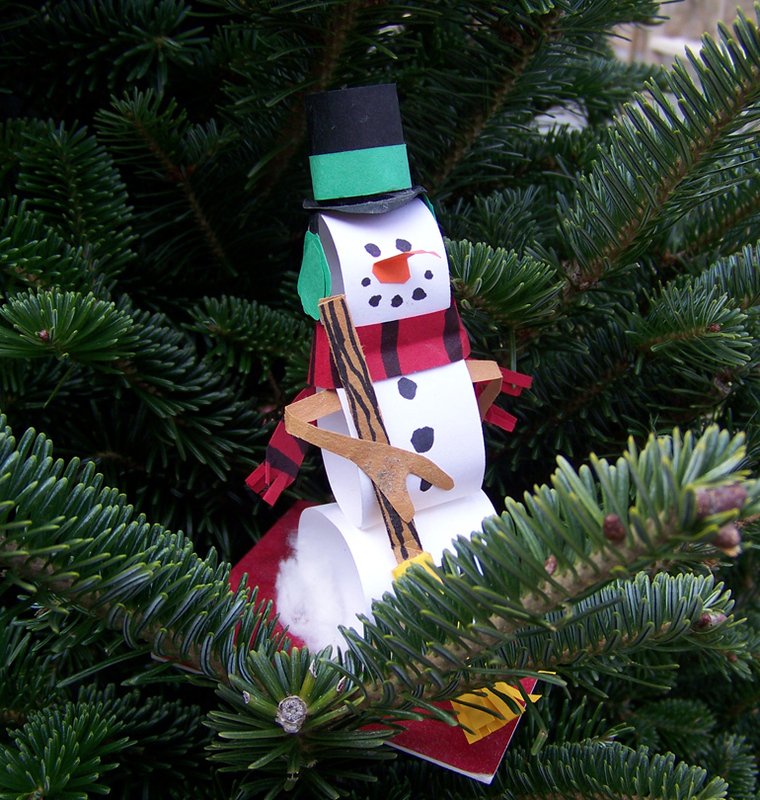 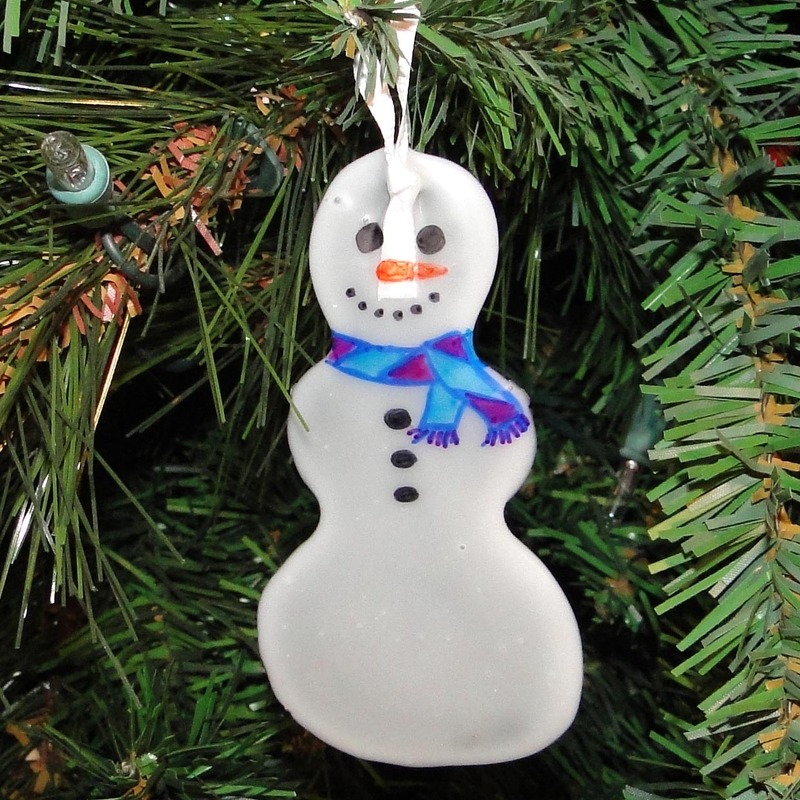 This cute snowman ornament is made with PVC pipe pieces of 3/4th-inch thickness. 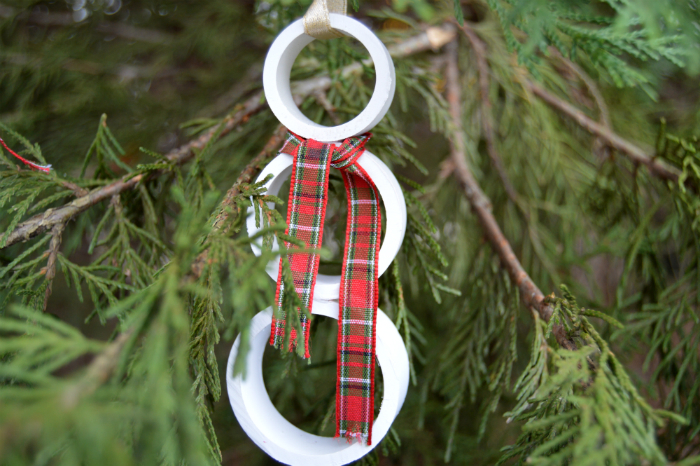 While cutting a PVC pipe ensure that you clean off any excess plastic sheddings. 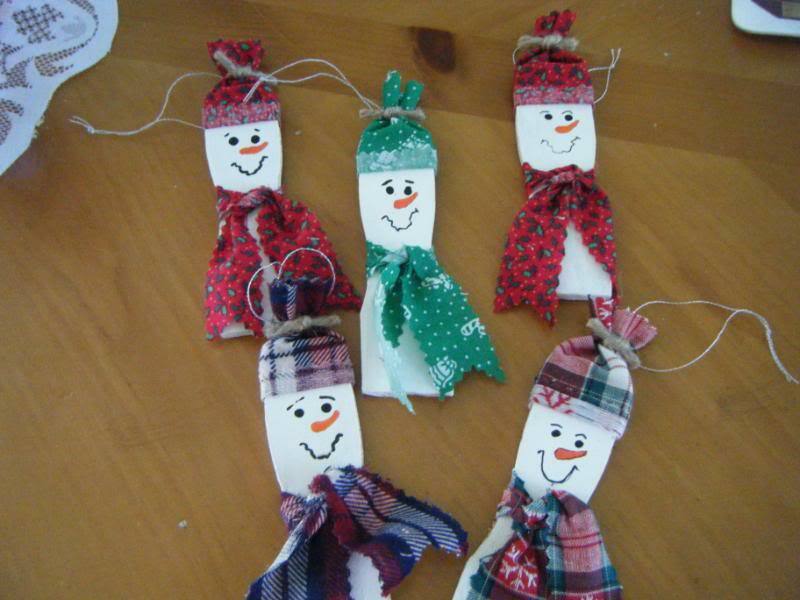 Teachers can do this fun and easy craft with preschoolers. 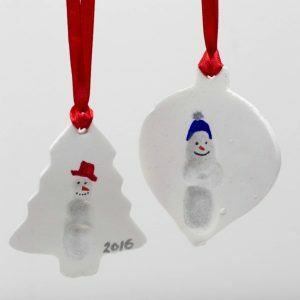 It teaches them handprint art. They can then be given away as holiday gifts. 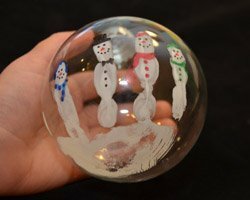 A baby’s handprints can also be preserved in this way. This one is a perfect holiday craft for little ones when they are stuck inside during snowy winter days. The main supplies include clear bulb ornament, Styrofoam snow, pipe cleaners, pom poms, ribbons and twine. 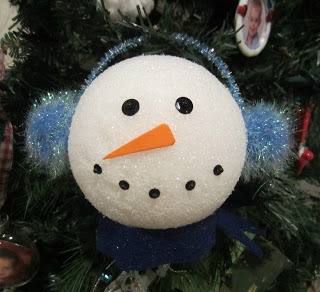 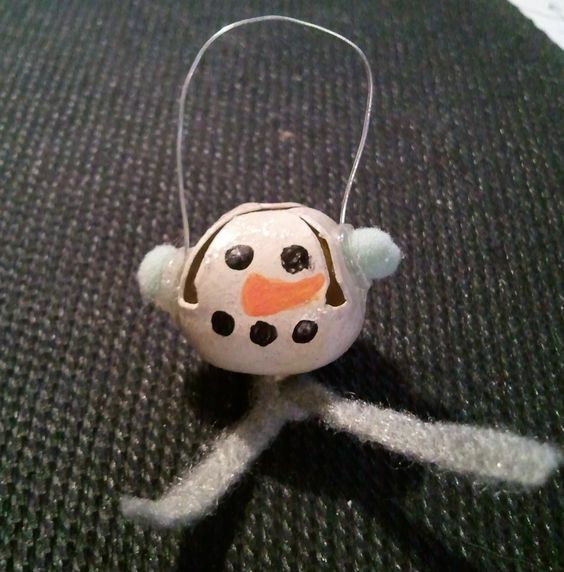 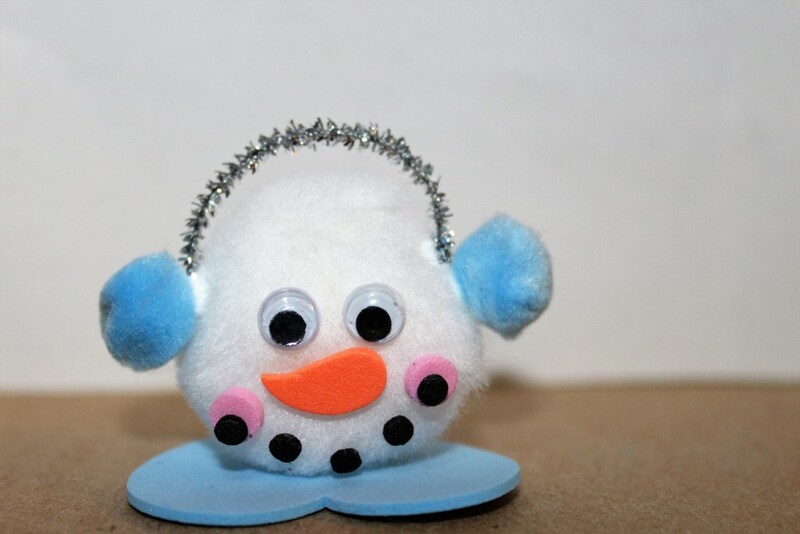 This plump snowman face is made with a Styrofoam ball while big pom poms make the ears. 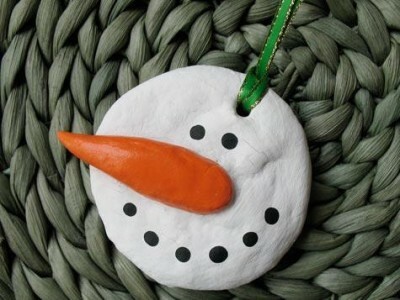 Orange felt is used for the triangular nose. This project begins with gluing the eyes and nose to a large white pom pom that serves as the face. 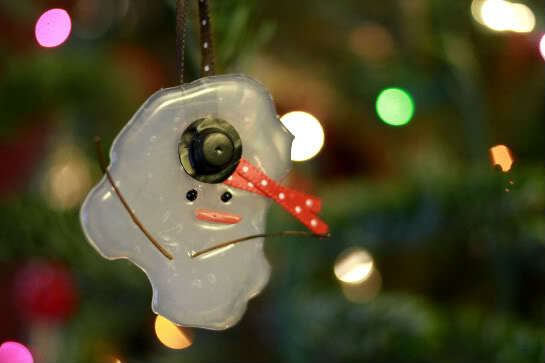 Then comes the placement of the blush of the cheeks and the smile. 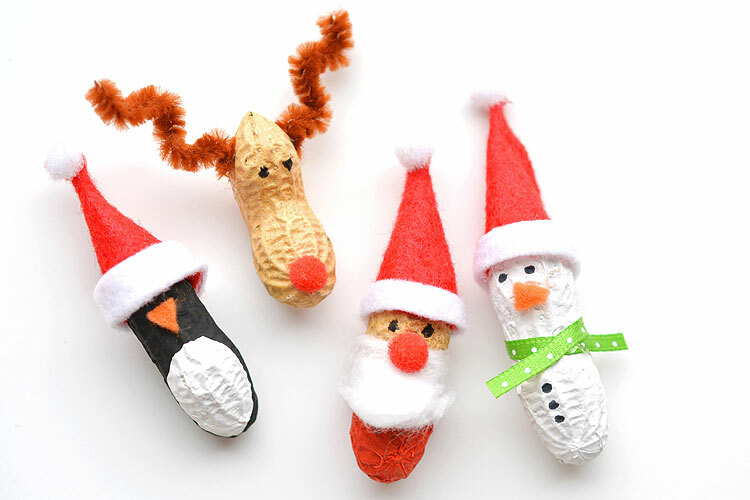 Start this DIY with a tiny piece of fabric that is frayed at the ends and tied in the middle. This is the scarf of the snowman. 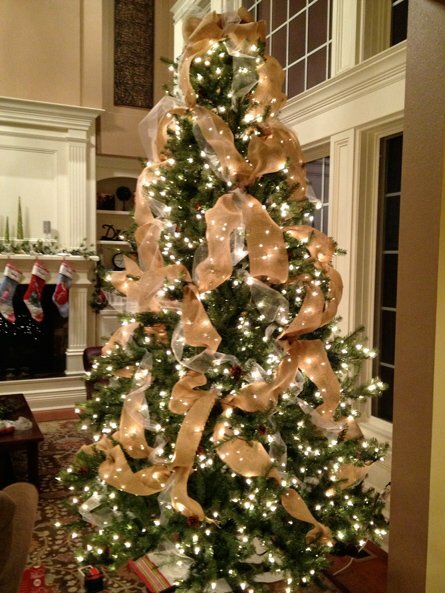 For the rest of the steps, click on the above heading. This one looks like LED snowman ornaments but is actually made with a tea light. 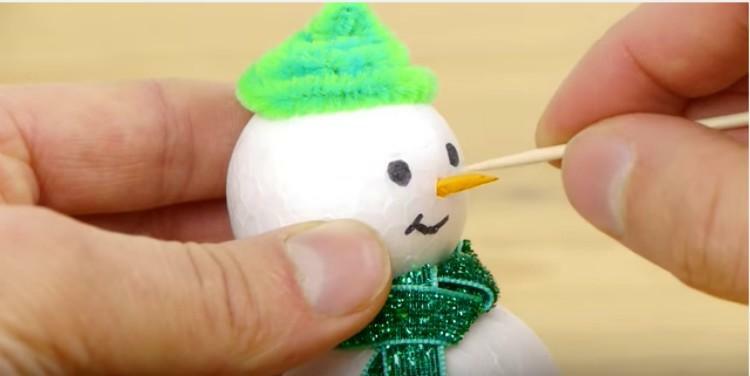 It looks perfect as the carrot nose. 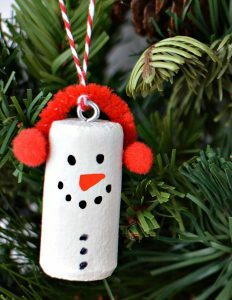 Kids would love to be a part of this fun craft. 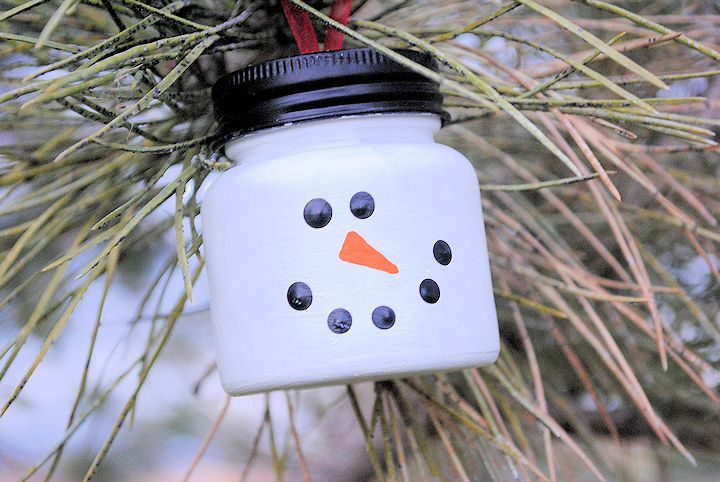 You would mainly need a recycled mason jar lid and Crayola paint for this. 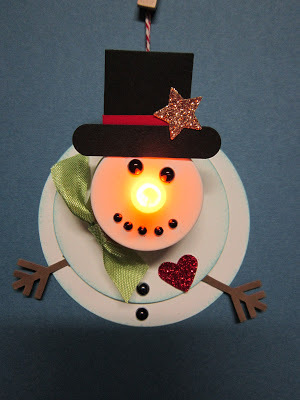 This happy fellow is made with a circle punch, die cut and a tea light candle. The hat and arms are also punched. Doesn’t it look like a LED light snowman? 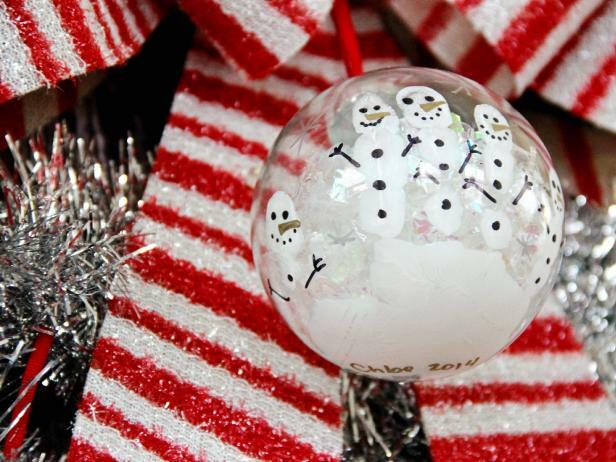 Clear ornaments are filled with confetti or faux snow to add some sparkle and color to your holiday decorations. 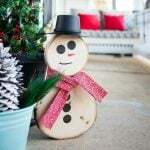 These wood slice snowmen are going to melt your heart as you sit by the fireplace adoring the beauty of your Christmas tree. If you want, you can personalize it by writing names. 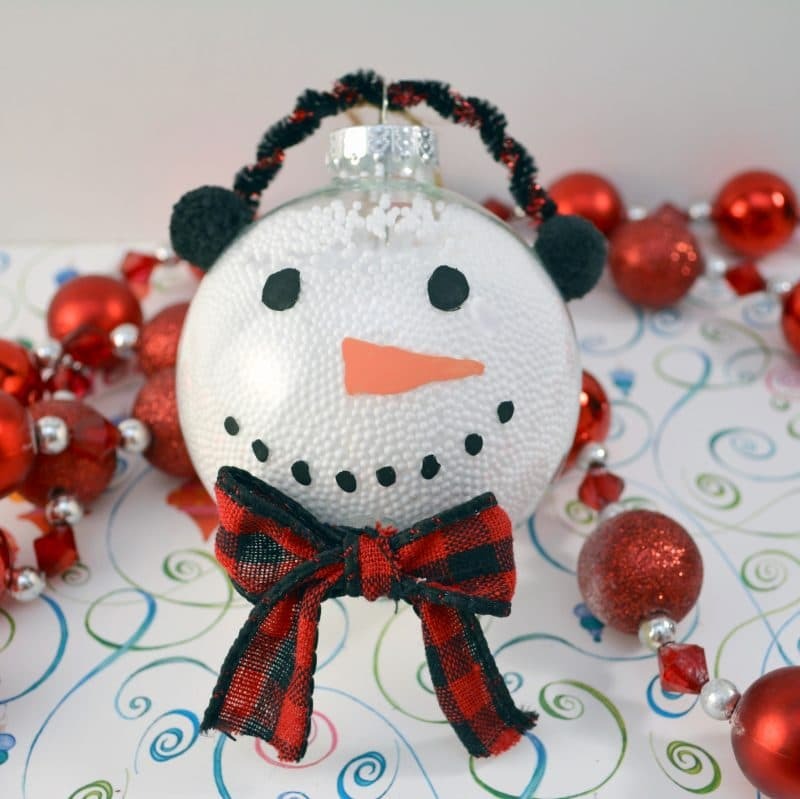 Start by painting a light bulb with glue and sprinkling white glitter over it. 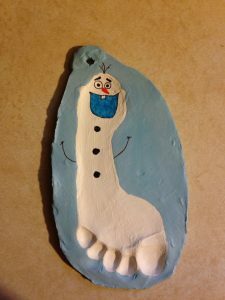 Let dry and then apply a second coat of glue to seal off everything. 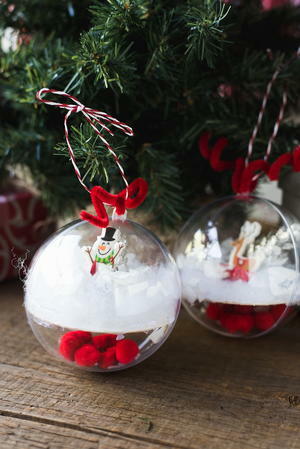 For this DIY, just take a clear glass bulb ornament and fill it up with fake snow. Close the top lid to seal off everything neatly. 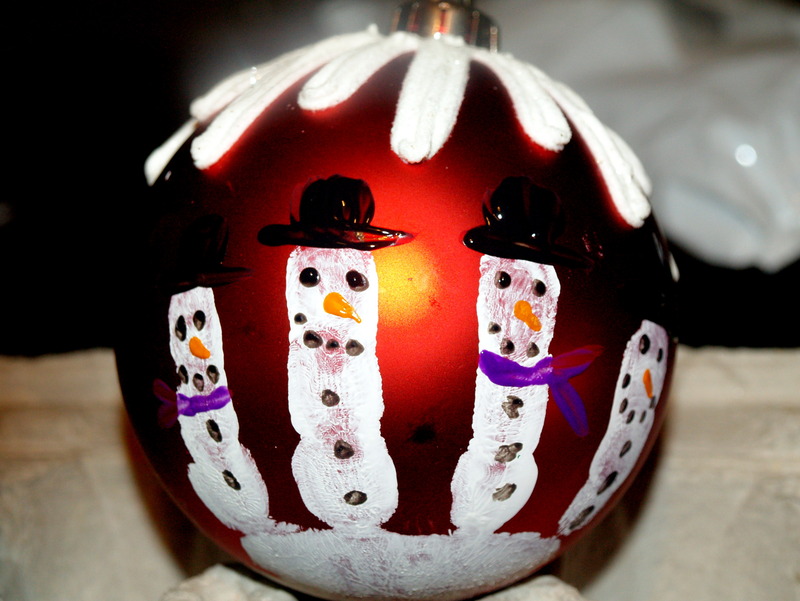 Then you can paint the facial features. This snowman is made of glue but uses a very small amount of it. 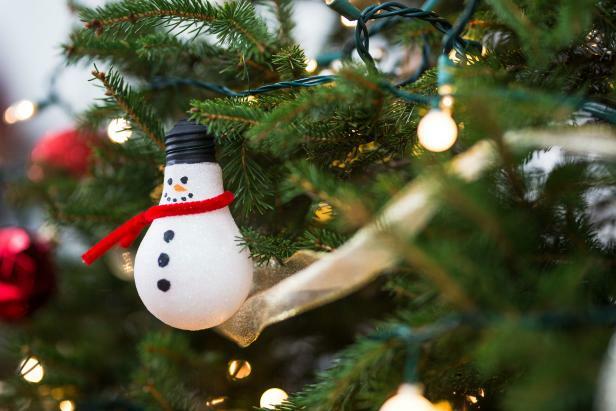 So you won’t have to worry about things getting messy. 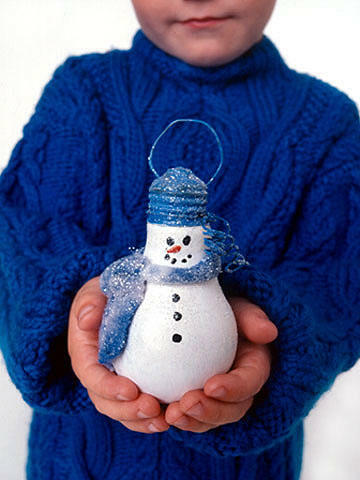 Just paint the right hand of a kid white and let him hold a spherical Christmas ornament with his hand. 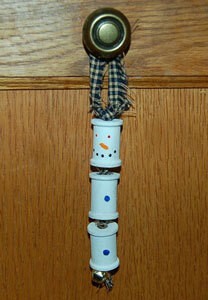 Your job is half done. 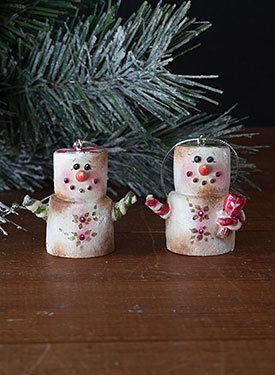 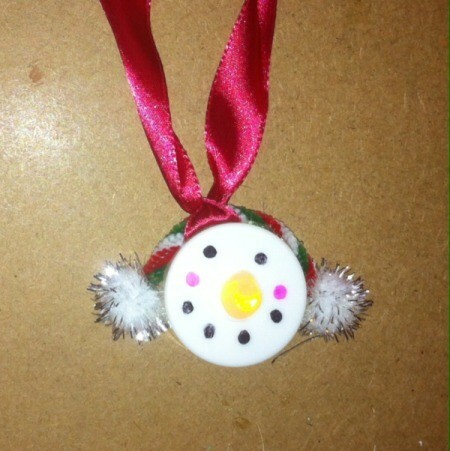 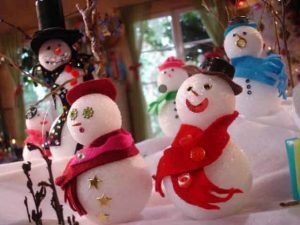 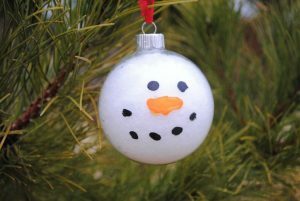 The above-linked article contains tutorials on creating glittered snowballs, stand up snowmen and snowman ornaments. 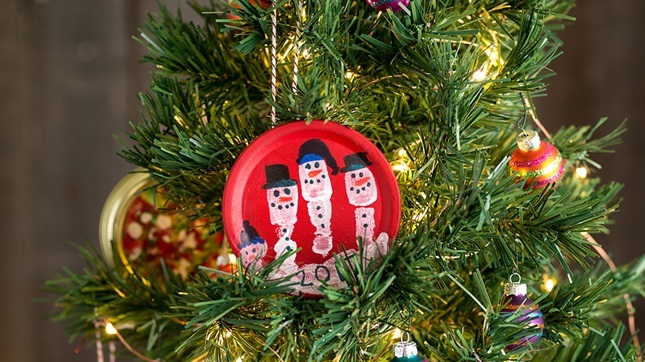 The impression of the tiny hands of a child looks beautiful in the backdrop of a red Christmas ornament. Just a few black dots and orange noses complete the decoration. 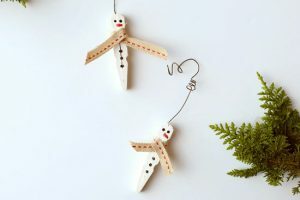 Wood slices fitted together and wrapped around with a scrap piece of fabric look rustic when hung from a Christmas tree. 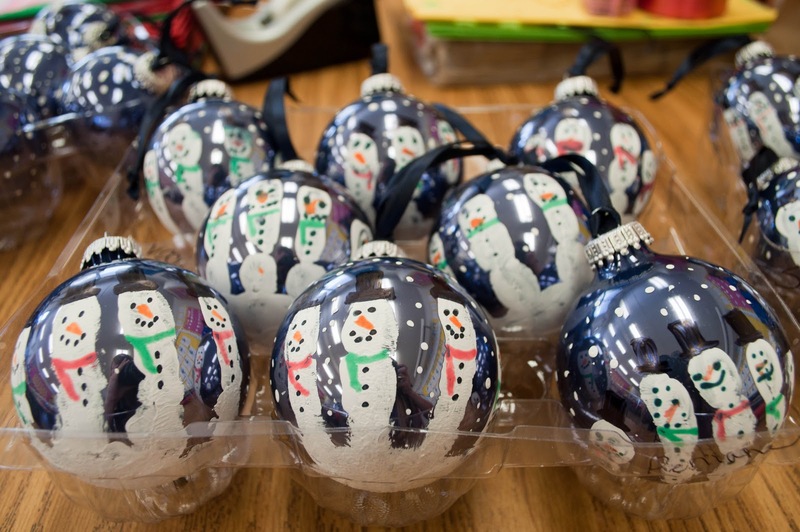 It is handprinting once again, this time with acrylic paint and violet Christmas ornaments. You can make a dozen in a just a small amount of time. 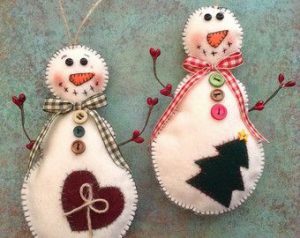 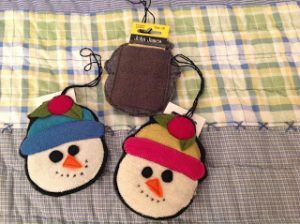 These lovely snowman heads need just a little bit of stitching. 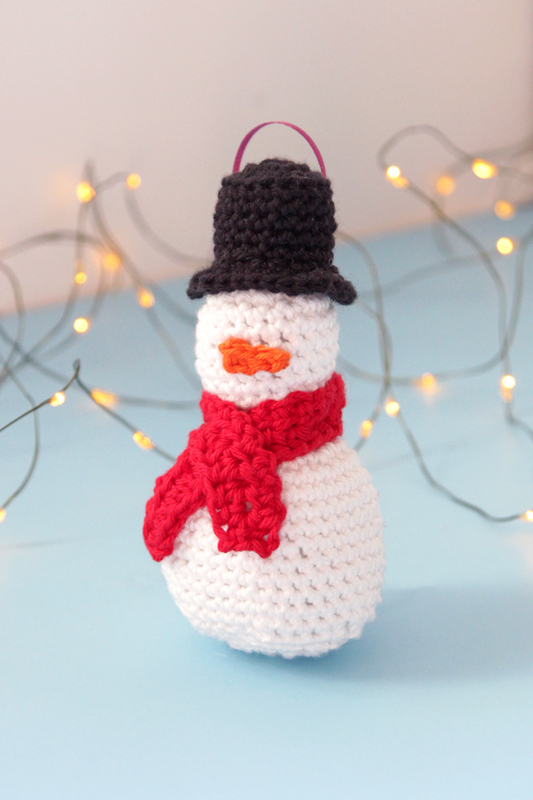 You can attach some yarn at the top to turn them into Christmas ornaments. 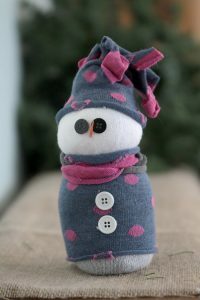 It is interesting to note how a tiny strip of fabric is made into a snowman hat by tying it at the top with twine. 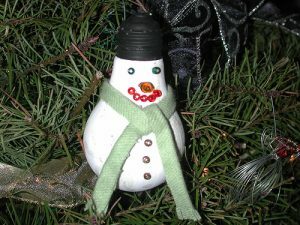 Another strip is wrapped around the neck of the light bulb to resemble a scarf. You can make this with a baby sock if you want. 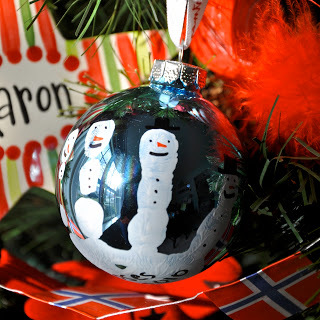 Note that the hat serves the purpose of hanging the ornament. 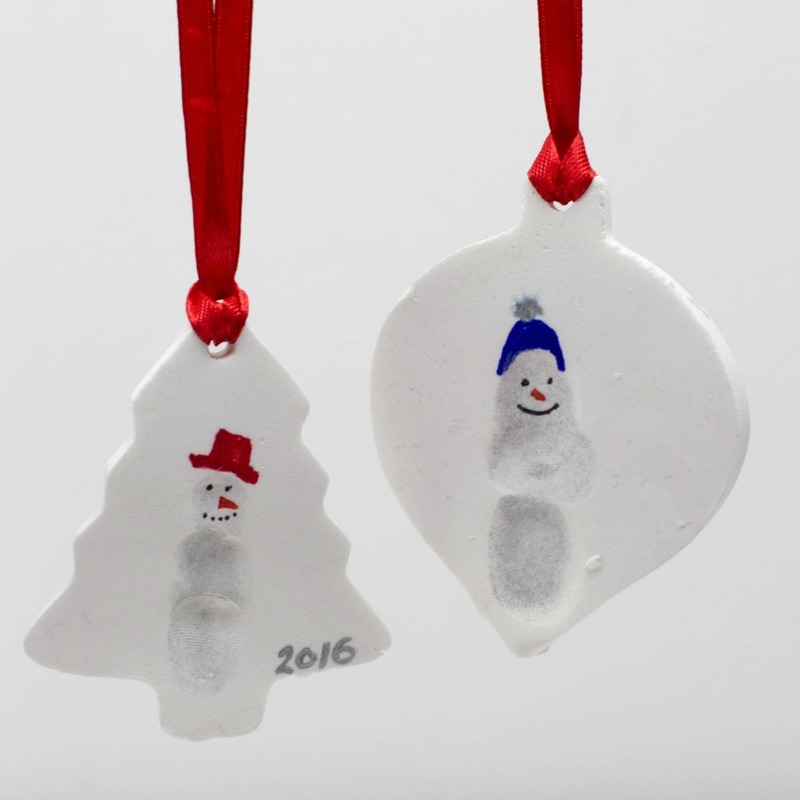 The below are basically thumbprint impressions on clay. The head of the snowmen are painted. 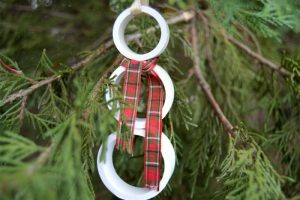 They have a hole at the top from which they are hung by ribbons. Similarly, a footprint impression can be created and painted to resemble Olaf. You can glue white buttons, one on top of the other, to make an unconventional snowman. A piece of blue yarn serves as the muffler. 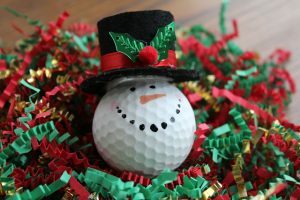 You can also make a jingle bell snowman by using a bell, black marker (for the eyes and mouth), white spray paint for the bell and orange spray paint for the nose. 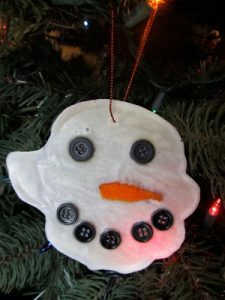 We are sure that by now you have got ample ideas of making snowman ornaments for your Christmas tree. The supplies could range from buttons to PVC pipes. 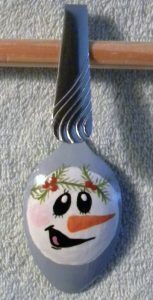 The melted snowman has surely melted your heart by now. So what are you waiting for? 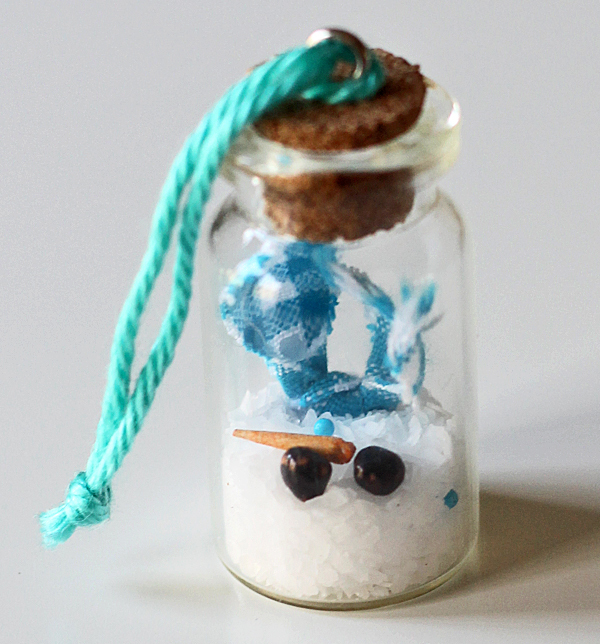 Gather your supplies and get going.